I have at least half a dozen projects in motion right now, none of which are finished. But, I did finish something recently that I started YEARS ago. So many years ago, in fact, I’ve lost track. 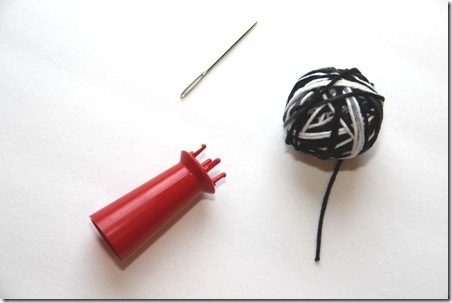 If you’re not familiar with what a knitting knobby is, maybe you know it by another name, such as corking, Bizzy Lizzy, spool knitter, knitting mushroom, Knitting Nancy or French Knitting. If none of those ring a bell, I might be sounding a little crazy by now. But this is a craft that has been around for a very long time, and if you didn’t try it as a kid, it’s never too late. A website called Needlepointers has lots of links to information about knitting knobby projects, including this PDF from Hasbro (yes, the toy company) from 1945. I started this because I fell in love with that black and white yarn in the first photo. I can’t knit or crochet, which limits my ability to use yarn in a productive way. But I was also looking for an easy craft I could do while watching TV with my family and it doesn’t get much easier than a knitting knobby. I started, with no plan as to what I was going to do with this long thing I was “knitting.” I’d pick it up every once in a while, make it a little longer, then put it away again. Sometimes it stayed there for months, probably even years. At some point I decided I’d just stop when I ran out of yarn. Fast forward to 2012, year of the infinity scarves and t-shirt yarn necklaces. When I realized I could actually make something I could wear from my little project, I was kind of ecstatic. No one wants to work on something for that long without a purpose. I almost made it to the end of the ball of yarn, but once I decided what to do with it, my impatience won. I finished it off, tied the ends together and here’s what I ended up with. Of course, now that it’s finished it’s warming up around here. I’ll will probably have to wait until the fall to wear it, but what’s a few more months for something years in the making?